With the money raised from the Heel to Heal 5K, Emory PA students are able to purchase medical supplies and medications for the South Georgia Farmworker Health Project. 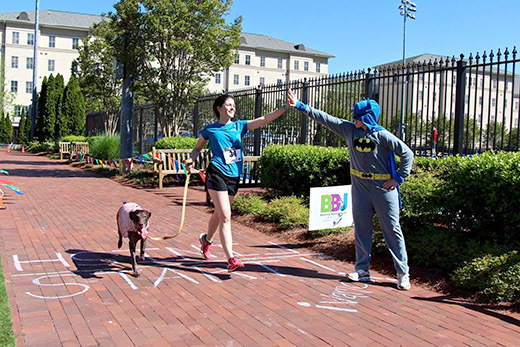 The Emory University Physician Assistant (PA) Program is gearing up for the 16th annual "Heel to Heal Superhero 5K and Fundraiser," scheduled for April 22. Students in the physician assistant program are raising money to purchase medications and supplies to provide free health care to farm workers in South Georgia, as well as to underserved families in Atlanta. Heel to Heal is an organization to help underserved people in Georgia, run by the Emory University Physician Assistant Program. The students travel to South Georgia for two weeks every June to take part in the South Georgia Farmworker Health Project. "We set up tents and folding chairs, which act as temporary clinics, to provide basic medical care to 1200 to 1600 farm workers and their families," says Juliana Fritz, student in the Emory Physician Assistant Program and lead organizer for this year's 5K and fundraiser. "These people otherwise have little or no access to care. With the money raised from the 5K, we are able to purchase medical supplies and medications for our trip south." The PA students also volunteer their weekends to provide care to the uninsured, underinsured and at-risk population at several community health centers around metro Atlanta. Medical services include basic wellness checks, physical examinations and access to free medications. After the race there will be free massages, free food and refreshments, activities for children, live music and a raffle with lots of prizes. The best costume and the best pet costume will be awarded, so be sure to dress up! 8:30-9:30 am – Pick-up goodie bag and race bib. Bring ID to check in. 10 am - Ready, set, go! The cost is $30 per person, and $35 per person on race day. Children 10 years of age and under run free with a paying adult.